Just like with every Apple-branded accessory for iOS devices, the official Apple Watch bands are quality but steeply-priced products. However, it turns out that with a little bit of digging, you can find similar products at only a fraction of the price that Apple asks for the official bands. For those who are on a budget but are unwilling to sacrifice on design or quality, we've rounded up the best third-party Apple Watch bands that don't break the bank. In what follows, we're going to show you a few affordable third-party bands for the Apple Watch that you can purchase from Amazon. Since we're looking for alternatives to the official bands, we've limited our selection to bands that mimic the design and the feel of Apple's own bands for the Watch. Note that the Apple Watch bands are not listed in any particular order. Furthermore, feel free to share your personal favorite in the comment section, and we'll update this article to include any top-notch suggestions that you guys may have. While Apple charges $49 for the fluoroelastomer-made band, it turns out that you can get something very similar for just $12.99. Gorillatronics offers its thin and lightweight silicon bands in a wide array of colors. The official stainless steel for the Apple Watch may be a quality product but its price is one of a whopping $449, which is actually more than the wearable itself. If you're looking for something similar but much, much cheaper, Eoso has a stainless steel replacement band for the Apple Watch available at just $49.99. If you're looking for an affordable alternative to Apple's Milanese Loop band for the Apple Watch, this one from JETech costs just $22.99. Like Apple's official band, this more affordable option is made out of stainless steel. Aside from the silver and black color options, you can also get this band in rose gold. Those interested in a leather band for the Apple Watch should check out this product from eLander. The band itself is made out of top-grain leather and you also get a stainless steel metal clasp, all for the price of just $17.99. Black and brown models available. For reference, Apple's Classic Buckle band costs $149. While you won't find anything similar to this band in the Apple Store, you can consider this one as a wild alternative to the classic buckle. We're particularly fond of the brown version that you can see pictured above, but you can also get it in black or red as long as you're ok with an alligator pattern. 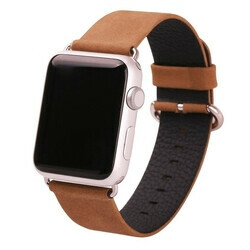 Do note that this band is made from genuine leather, which is the lesser-quality leather type. If I had a smartwatch I would never buy official bands from the OEM. Apple charges way too much for their bands. The other thing is Apple still charges to much for their sport watch, especially since its made of ion X glass and aluminium. Where as a ton of other smart watches start with stainless steel and leather or steel bands. If you want just the steel cased Apple watch, then add an additional $250. So not worth it. Thanx for all that info, we had no idea of.